Splinter city, originally uploaded by bestviewinbrooklyn. 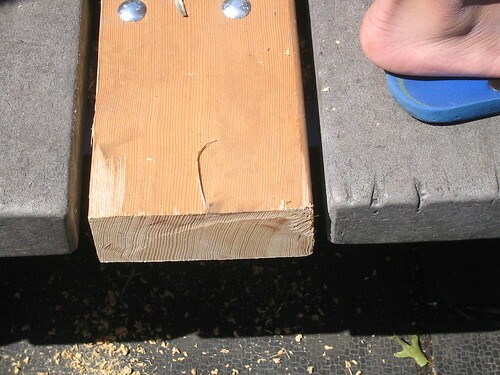 One of the planks on the playground equipment was missing from (at least) Friday AM through Sunday PM. This photo was taken on Monday AM. The plank used to replace the missing faux wood plank is very real, very unsanded wood. So, in addition to the glass in the sprinkler area (and tree wells and walkways), the dog poop scattered about, and the occasional needle on the ground - count splintery wood into the mix. Shoes are your friends, even during the summer! With this, you have crossed the line. You are worried about splinters? Yuppies like you are slowly ruining Sunset Park. Just move to Park Slope already. And please come up with something original as a suggestion for where I should go. I'm surprised you didn't include a mid-western state in your comment. Although I especially appreciate the Y part of Yuppie. Thanks! It's people like Anonymous who think a "raw" Sunset Park is the only authentic Sunset Park. Why should my children have to put up with the same kind of stuff that I did in the park? I never got to enjoy the park as a small child because I brought needles back to my mom a few too many times. That was it - just the front stoop for me until I was old enough to sneak out on my own. I don't see how being worried about whether or not you end up with a crying child is more of a yuppie attitude than a long-time Sunset resident attitude. Every family I have known since I was growing up here in the 70's cares whether or not their children and grandchildren get hurt - yes, even by a splinter. Maybe you want to live in a place where people shrug and say "Whatever" to issues. Personally, I think that's the least authentic attitude for someone to have if he actually cares about the neighborhood as more than an "image." Thanks, Raised. Not sure how wanting to keep your kids from getting hurt is a "Yuppie" thing to do. I'm pretty sure every good parent wants that. I think Best View has done a great job of highlighting everything that makes Sunset Park the special place we all want to live -- the diversity, the food, the park, the neighbors. Not sure anyone lives here for the splinters and needles. I can attest, as BVIB's husband, that she and I aren't really *young* anymore, so at the very least, Anonymous missed the mark with the "Y" part of "Yuppie". And also, what the other two commenters said.